The FieldReveal platform provides a comprehensive view of field and crop conditions. Our platform makes it easy for agronomists to evaluate important plant nutrient levels and soil nutrient needs for each field. Our multi-layer approach identifies variability in residual nutrients like nitrogen, phosphorus, potassium and zinc that single-layer zone management programs may not see. Connect with farmers, crop consultants, dispatchers, soil samplers, custom applicators and everyone else involved in the farming operation. Keep the people involved moving and communicating, saving time and creating efficiencies. 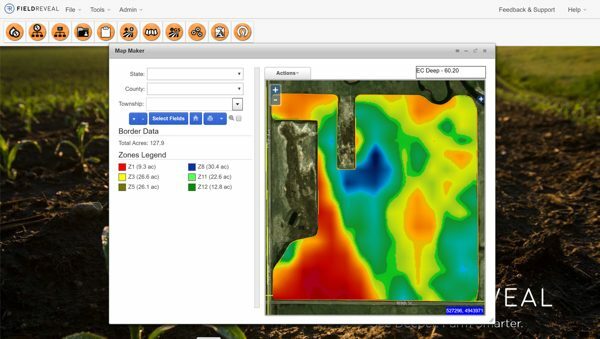 Access FieldReveal Tools for field prescriptions, variable-rate planting maps and critical insights. Our intuitive, cloud-based platform allows agronomists to build relationships and work more closely with farmers on a field-by-field basis. It’s easier than ever to write prescriptions, download application files, print application reports, view field maps and soil sample data, and more. Agronomists can streamline their workflow by communicating and sending orders from FieldReveal Tools directly to soil samplers, custom applicators, dispatchers, and more. Our knowledgeable team of GIS and data management experts use state-of-the-art software to integrate data and provide support to agronomists who use FieldReveal Tools. Our multi-layer zone creation approach collects and curates field data from various sources, including soil electrical conductivity (EC), RTK-measured elevation and GNDVI crop vigor measurement. The information is sent to the FieldReveal™ Mapping Center where up to twelve different management zones are identified and created within a single field. Whether you’re looking to leverage years of traditional field and soil sample data, create new grid missions of any size or implement a new zone strategy across the field, FieldReveal makes it simple.